Discrete, ill-posed diffusion equations arise in a variety of contexts: in models of granular flow where they describe the formation of shear bands in a granular material undergoing anti-plane shear, in image processing where they consitute one of the most well-known models -- called the Perona-Malik method -- for denoising images, and in population dynamics where they describe the chemotactic motion of certain types of bacteria. We study the coarsening phenomena observed in these models using a technique introduced by R. V. Kohn and F. Otto. Esedoglu, S.; Greer, J. Upper bounds on the coarsening rate of discrete, ill-posed, nonlinear diffusion equations. Communications on Pure and Applied Mathematics. 62:1 (2009), pp. 57-81. 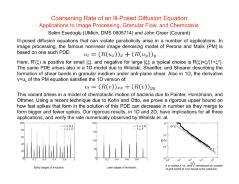 Esedoglu, S.; Slepcev, D. Refined upper bounds on the coarsening rate of discrete, ill-posed diffusion equations. Nonlinearity. 21:12 (2008), pp. 2759-2776. Esedoglu, S. An analysis of the Perona-Malik scheme. Communications on Pure and Applied Mathematics. 54 (2001), pp. 1442-1487. Esedoglu, S. Stability properties of the Perona-Malik scheme. SIAM Journal on Numerical Analysis. 44 (2006), pp. 1297-1313.